Did the year 2015 seem different to you, but you couldn’t put your finger on why? I figured it out for you: best I can tell, it was the first calendar year in over two decades that the Inspirations did not release a new recording of exactly 10 songs. Never fear…the boys from Bryson City decided instead to kick off 2016 with Pray for Me, their new CD of, you guessed it, 10 songs in their singular traditional quartet style. After nearly a decade with the same vocal lineup in the 2000s, this is now the sixth different vocal configuration to record for the Inspirations in the last seven years, with multiple changes coming at all four parts. On this CD you’ll hear Harold Reed for the first time on tenor, Joseph Brown for the first time on bass, and longtime Inspirations both on their second tour of duty, Matt Dibler and Melton Campbell. While Campbell’s vocals are on the CD, he has left the quartet since recording, replaced by Roland Kesterson. I hope that they will give Kesterson the baritone features and keep them in concert rotation, since they are very good. “God’s Already There,” written by Joseph Habedank and his mother Leah Sandlin, is a beautiful and tender ballad out of the same mold as the outstanding “I’ve Found a Faithful Friend,” which featured Campbell on the last Inspirations recording. On the other end of the spectrum, Campbell shines on “What All the Shoutin’s About,” a fun and fast-paced number. You can’t have an Inspirations recording without an assortment of uptempo quartet songs. If you want those, where better to turn than Dianne Wilkinson and Rebecca Peck? They contribute the aforementioned “Shoutin,” and “Onward to the Goal,” featuring Reed. Wilkinson flies solo writing “Surely I Come Quickly,” which also features the tenor. The latter two are more of a light convention quartet style, Inspirations all the way. They also throw in a cover of the classic “Daniel Prayed,” which will likely be a concert staple. Matt Dibler has always been one of my favorite lead singers in gospel music. His clear and solid voice are perfect for what the Inspirations do. There may be no greater match between singer and song this year than Dibler and “It’s Under the Blood.” I love the combination of Pastor Leonard Fletcher’s writing with this quartet, going back to the truly great “I’m Not Ashamed”. “It’s Under the Blood” is not a brand new song, but I am not aware of any national groups recording it until now. It’s the highlight of Pray for Me, and should also be a shout-‘er-out highlight of the Inspirations’ concerts this year and in the years to come. I hope the Inspirations will record Leonard Fletcher songs ’til Jesus comes! If you have been reading here for a while, you know that I always “root for” the Inspirations. I have a personal attachment to their music going back to my childhood unlike any other group, and I feel they occupy a much-need space in gospel music. Though these days you may not be exactly sure what singers you will hear, you will always know what the Inspirations will sound like, and I find that comforting. With a batch of quality new songs on Pray for Me, there is no reason to stop anytime soon. Keep on keepin’ on, Inspirations. 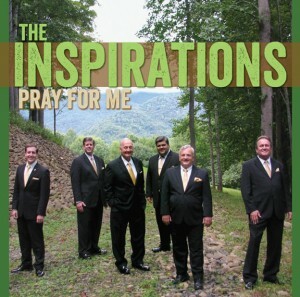 I love this new cd by the Inspirations. I’ve always loved the group through the years.